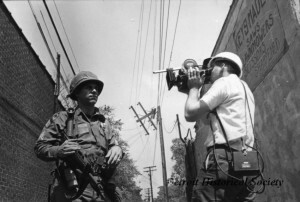 A film crew interviews a National Guardsman. From the Detroit Historical Society Collection. As part of the Detroit 67 project, the Society is creating the most comprehensive collection of written, audio and video histories ever assembled on this topic. The Society’s oral and written history online archive is a unique and invaluable resource, universally accessible to students, researchers and everyone with an interest in Detroit’s past and future. A wide range of perspectives is represented, including those of individuals who were present and in positions of authority in 1967, people who lived in the city at the time and have remained, and people who have moved away. In addition, we have interviewed people who were not yet born in 1967 but have been eager to reflect on how the events affected their lives, their families and their future. Numerous community leaders have been interviewed, including Reverend Wendell Anthony, Edward Deeb, Dr. Karl Gregory, Mike Hamlin, Donald Lobsinger, Marsha Battle Philpot, Reverend Lonnie Peek, Bob Roselle, Harriett Saperstein, and Adam Shakoor. If you have questions, contact the Detroit 67 project line at 313.885.1967 or email detroit1967@detroithistorical.org. If you have memories about life in or around Detroit in 1967, sit down with a friend, peer or loved one and record a conversation about your experiences. Arrange to meet with a parent or grandparent, relative, friend or neighbor to record their experiences in 1967. Contact the Detroit 67 Project to see if there are individuals and/or organizations in your area that are participating in this project who can get you involved in the process.